2018 update – please click on this link to see a MUCH more detailed compiled collection of Lead Forensics reviews from multiple sources: https://www.a1webstats.com/2018/08/04/lead-forensics-reviews-2018/. That new page helps you to see which reviews are biased, and which are genuine. That new page is your one-stop shop to give you everything you need to know about Lead Forensics, as reviewed by people. The content below is still visible but offers only a fraction of the insights of the new page. 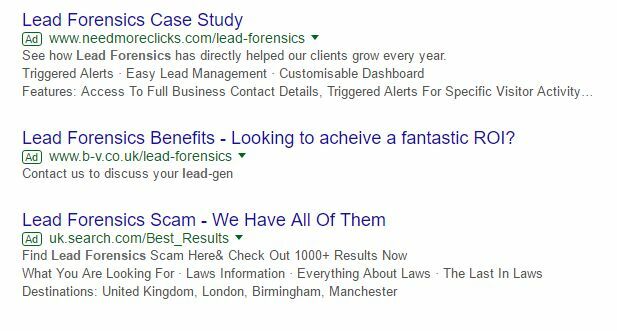 Over the past years we have analysed the Google results that appear when searching for ‘Lead Forensics Reviews’. People who are considering Lead Forensics want to gain other perspectives before committing to what is a long-term and costly commitment (compared to other solutions on the market, including ourselves). We feel that the Google results do not actually provide a lot in the way of impartial reviews, although have improved since the previous year (see further down for more details on this). You may also be interested in the key differences between us and Lead Forensics. We’ve been analysing what appears in Google for ‘Lead Forensics reviews’ for many years now. Something that hasn’t changed from last year is that the paid ads continue to be a combination of Lead Forensics ‘friends’ and competitors to Lead Forensics. 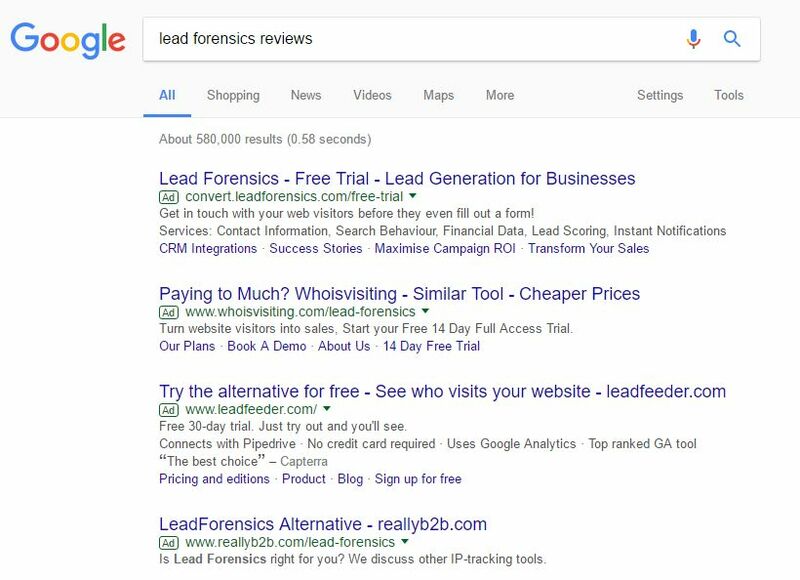 Let’s start by saying that you can’t rely on any paid advertising to present an unbiased review (of most things) so if your interest is in impartial reviews of Lead Forensics then you can probably skip right over those paid ads. Two were Lead Forensics themselves (the Really B2B one was part of their group, and for some strange reason, Google allow them to be visible even though it’s blatantly clear that it’s the same business). Two were friends of Lead Forensics (effectively, just signup pages). One was an odd uk.search.com result, which didn’t seem to have any meaningful purpose. The top result is Glassdoor, which has reviews about the company itself, from people who work there. So not reviews about the product itself (and to be honest, based on conversations we’ve had with ex-Lead Forensics workers, not a full reflection). The second result is from G2 Crowd, which can definitely be seen as genuinely impartial in their reviews. What’s fascinating about the people who reviewed on there is that some are scathing of Lead Forensics and others are enthusiastic. Why is that fascinating? Because reading the comments from some of the enthusiastic people demonstrate how much they are limiting the success of their businesses by making comments such as ‘effectively replaces Google Analytics for our business’, which demonstrates a lack of understanding of what analytics is all about. Overall though, the G2 Crowd reviews appear to be untainted by engineered reviews. One is a page from the Lead Forensics website (so it’s not going to help as an impartial review). A search result that is consistently high in the organic Google listings is http://www.ukbusinessforums.co.uk/threads/anyone-use-lead-forensics.247390/. That forum discussion has been around from 2012 onwards and, like G2 Crowd, has a range of reviews, although tends to be more critical about Lead Forensics. Again, there don’t appear to be any engineered reviews. Three results are ourselves (A1WebStats). One is an old review still within the Google results. Another is our review update from 2016, and another is a page about pricing, which Google has decided to list as relevant to reviews. None of those could be considered to be impartial because we’re in the same business space. There is a useful review from a company called Merrie Marketing at http://www.merriemarketing.com/lead_forensics_review/. It’s well-considered and clearly impartial, although it does make the observation that it’s not much use for targeting small businesses, which would be better worded as “it tracks businesses of all sizes, but there will often be some smaller businesses that can’t be tracked by their IP address”. That, of course, is based purely on what we see at A1WebStats. Finally, similar to Glassdoor, there are reviews from employees about Lead Forensics, but they don’t really help with getting an understanding of the product itself. It’s interesting what difference can be seen within a year of doing these reviews. 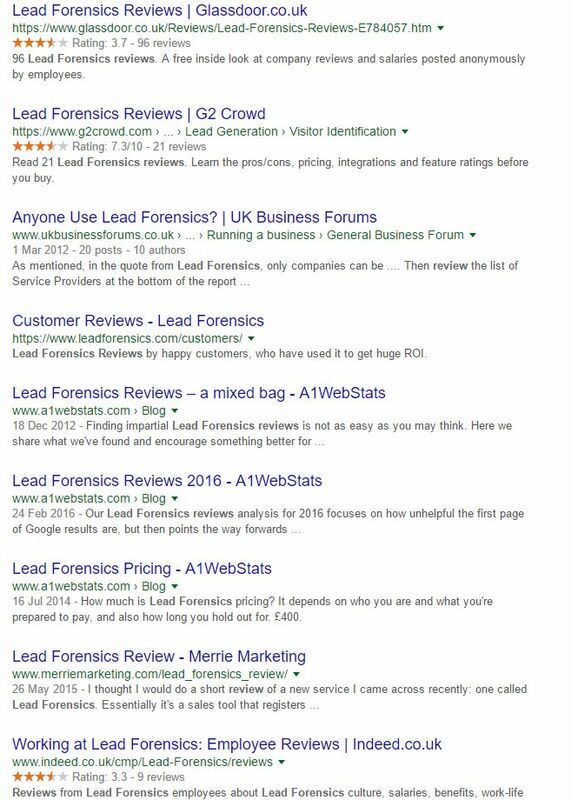 Last year (2016) the organic search results contained a lot more of reviews apparently engineered by friends of Lead Forensics, plus more in the way of their competitors appearing (at the time of writing, we see only ourselves appearing). Now the picture is more useful for Google searchers, as there are a definite three separate results on page 1 that lead to what could be considered impartial reviews. You’ve been contacted by Lead Forensics and are considering their offering but want to see what other people say. You’re an existing user of Lead Forensics, are having doubts about what you signed up to, and want to see what other people have to say. You’re an agency thinking of reselling Lead Forensics and don’t want to commit the resources into it unless you’ve got a better picture of things. On this point, if this is you, our resellers page should be of interest). Before A1WebStats started, we used Google extensively to see which companies appeared when we made various searches (for example, ‘companies visiting my website’). There was nothing of significance there, and certainly not Lead Forensics. Month to month payments with no contracts (with optional discounts for paying longer periods of time) and easy to cancel at any time. A fee (currently £59 per month) that covered our costs, made some profit, but focused on the pockets of our target audience – small to medium sized businesses. A product that doesn’t just track IP details, but goes into great depth about website visitors, finding ways to get more results from website traffic overall. In short, doing the bits that Google Analytics doesn’t do well. Over time we became aware of Lead Forensics because they actively contacted our customers and trial subscribers, effectively trying to ‘muscle in’. So we responded accordingly, making ourselves visible when people were looking for alternatives to them. Think: big company (them) vs small company (us). Try Lead Forensics and try us and others all at the same time. Don’t be forced into a sale but do be open to discussing what your website data actually means because our history is in website success, not purely trying to follow up on companies that have visited your website (which is such a limited approach). Having invested time in looking at a range of solutions then you will make your own mind up about what’s right for you. Yes, we have frequent and daily conversations with people who have trialled Lead Forensics and have trialled us. We know about the sales tactics, spin etc. It’s just part of the daily routine. It doesn’t really matter what Lead Forensics try to do to us or others in our industry – it’s ‘business’ at the end of the day. What does matter to us though are ethics. We are 100% against any business paying for our type of software if they’re not going to gain from it. Whether that’s at Lead Forensics high pricing or at our lower pricing, there still has to be a return on that investment, and (in our view), that should be possible within a decent length trial period (30 days with full access to the data in our case but about a week typically with no login access to the data for Lead Forensics). The features Lead Forensics offer weren’t as useful as they thought they’d be. They found that the usefulness of the data wasn’t as great as they initially thought it would be, but had signed up for a long contract they couldn’t get out of. In short, they don’t need all the ‘bells and whistles’ or the costs, so they come to us to trial. If paying month to month (most do) then you can cancel at any time you want to, and there are no more payments from then onwards. We want our subscribers to throw their website-related problems at us so that we can show them how the A1WebStats system can help them. It’s a mutually beneficial relationship where we’re only as good as the month to month payments being gained, and we’re so happy to have a low cancellation rate and subscribers that have been with us for years (many right from the start). We’ve been advised so many times (by well-meaning business consultants) to “be more like Lead Forensics – go out there and push for the sales at higher prices”. But that’s not us – we’re all about helping businesses to succeed (via their website strength) in exchange for a fair fee, creating many subscribers who feel more like friends than customers. There is no-one in the world who can say that we’ve tried to ‘sell’ to them, nor will that ever be the case. To summarise our totally biased review of Lead Forensics, regardless of what we, or anyone else says about them, they are very successful. Whether it’s our review or anyone else’s, there is no substitute for doing a side by side comparison of similar software products so that you can make the decision for yourself. Whatever you decide to do, we hope you get the system that gives you the functionality that best matches your business culture and targets.